My goodness, gals! I'm so sorry.. It's been a busy working day here in the big KC and I was not prepared for Mingle Monday as usual. But don't you fret, the party has officially arrived!! I have been looking forward to this week for a while now... because it's my birth week! Yes, yours truly will be 25 this Saturday, and this week is full of celebrations and festivities! Don't you worry, I have a weekend update coming tomorrow, and I will also fill you in on b-day fun, so stay tuned! If you could find it in your big heart to pass the Mingle word along... I will love you forever and ever and ever. In all seriousness, I truly appreciate each one of you who take an extra minute to go the extra mile for me. I cannot thank you and your sweet generosity enough! Wishing you a glitter and puppy dogs kind of day! I'm not sure about the best birthday party I've been too... I'm not a huge group person, so I usually prefer just going to dinner with my friend(s). I visited [life of love] and Synfully Delicious, both fellow grad students with the cutest blog designs! I also visited Life of Love - and I LOVE LOVE LOVE her idea of "Dear Monday." Super cute! And best birthday party.... hmmmmm. I remember as a kid one of my friends always threw the best birthday parties. She had a big garage that she hosted them in - and we did a 1950s theme once. So fun! I can't remember the best party I've ever been to, which probably means I'm lame. I do remember one particularly fun college party in which I learned how to do the "Superman that..." dance (don't judge, it had just come out and was really cool). I visited Synfully Delicious (whose blog I follow!). This weekend, she ate sushi, made a trifle, and spend a lovely time with friends. Jenn from Going the Distances (whose blog I also follow!) who just got the cutest Target comforter that I'm thinking about buying 'cuz it's so darn cute. You know, copying is the sincerest form of flattery! The best party I've ever been to was the surprise party I threw for my hubby - good times! I checked out Synfully Delecious and Time for Everything - both were super cute! I really liked Relevant Notes and am now following her. Best party was a Toga/Roman Party last year ~ FUN!! I visited Momsbookshelf. Her recent post was really interesting on chiropractic care. I stopped by 'going the distance' and 'simple little joys' I am so pleased with the blogs I looked at, and I started following both of them. 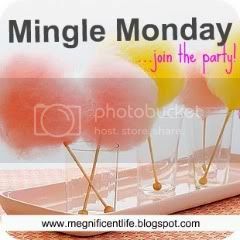 Mingle Mondays are great! I visited jenn @ going the distance and am so glad! totally related to her as soon as I started reading. Fabulous find! also, stopped by Morgan @ big grins make bigger smiles and discovered a recommendation for amazing jewelry, love them both! the best bday party i ever went to was probably my best friend's 22nd bday, it was after college and we were living together again in chicago. it was the BEST. lots of dancing + fun. xoxo jillian:: StyleMint Giveaway! I visited Greetings from Texas and Life of Love! Both adorable blogs! Megan is a cancer survivor and Sar (also from Texas) just got asked to be a bridesmaid in her friend's wedding...in the cutest way! The best bday party I've ever been to was just last weekend...it was a surprise 30th for my bf's brother! It was at a cosmic miniature golf place and was so much fun! The party started at 11 and we had the whole place to ourselves...18 holes of indoor, black light miniature golf with drinks in hand? So much fun! I love "Life of Love's" Dear list. The pillow quote was the best. It is endearing how men try to hard to make things pretty, but they never quite get it right. My boyfriend does the same thing. The Spinach dip on "First Day of my Life" looks pretty good. I might try that for a house party I'm having soon. It's been a while, as usual. I always come to your blog whenever I'm randomly reminded to -by my own thoughts. I love that. I decided to visit Shades for Every Adventure -and, I was oh so Sweetly surprised. Most recently, she wrote about "Karma," which is the EXACT thing I'd been thinking of writing about. With that said, not only did I enjoy her short & sweet post, but I have quickly regained the faith that there are "signs." The best birthday party I have been to . . . would have to be my own birthday party. This occurred in the 7th grade. I took my closest friends to a beach house on the Oregon coast. There was something magical about this birthday. And, it happened to be the one that no one will forget -I was turning 13, but I was sad to leave the age of 12. I took eternity to blow out my candles and make the best wish. I take wishes pretty seriously . . . because I believe they'll come true. May you find yourself Sweetly Surprised, once your wish comes true. Love & Grace. The best birthday party I've even been to was my Mom's 60th, because through the whole year I got her 60 presents that she opened that day, loved the expression of her face and her happiness!!! Today I visited "First day of my life" and she posted a delicious Spinach Dip recipe, a must try! And also a great blog (forgot the actual name) that posted about a much needed break advice! The best birthday was the surprise party I threw for my hubby's 30th Birthday. It was a huge BBQ and I had it catered by his favorite BBQ place! Excellent. Big Grins and talked about giveaways and how to get more followers. Funny, my blog this week is about my daughter's birthday.